ATHLETES from all over the region gathered at Lee Valley for the Eastern Region Championships; an event combined with Essex’ individual championships. 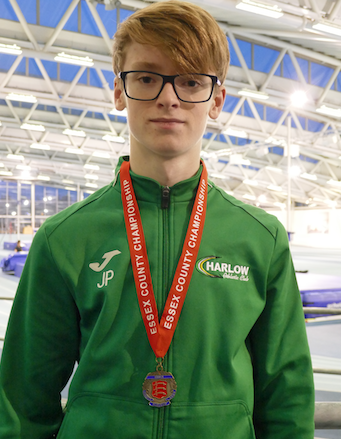 It proved to be a very fruitful weekend for Harlow athletes across the age groups. Mia Rowan was the first Harlow athlete to take to the track in the U15 60m hurdles. She was not expecting to progress as this is her first year in the age group. However, an excellent new PB, 10.01s and almost a full second quicker than her previous mark, saw her qualify seventh fastest overall for the semi-finals. She managed 10.07s in her semi-final which was not quick enough to make the final. In the Under 17 age group, Harlow had two athletes stepping up in age, Millie Upton and Grace Iyinbor. Hurdling in Essex is an event that is extremely strong in terms of national performances. Perhaps spurred on by this and by being in heats with junior internationals in, both girls did well clocking new personal bests: Millie dipped under ten seconds, 9.99s, for the very first time and Grace Iyinbor lowered hers to 9.74s. Beth Harryman ran in the Under 20 hurdles and reached the semi-finals. Her time of 9.55s was yet another hurdle PB for a Harlow athlete. Regan Lawrence was the only male representative in this event and he was making his first appearance of the indoor season. He was fifth in his heat and 9.40s was also a new personal best. Beth Harryman and Grace Iyinbor also participated in the only field event of the day, the shot putt. Harryman was fourth overall with a distance of 10.30m. Grace Iyinbor threw a distance of 8.71m to take silver in the Essex competition. Day Two was even better in terms of medal success for club and athletes alike. High Jump for all age groups was first. Beth Harryman won Essex silver with a best height of 1.60m. In the Under 17s Millie Upton also took Essex silver with a PB equalling performance of 1.40m. Abigail Dawson was making her first appearance as an a Under 15 and performed well to record a height of 1.35m. Meanwhile the Senior and Under 20 long jumps for men were underway. Leo Chashchin made a welcome recovery from illness and was rewarded by a very good series of jumps. His best of 6.54m was good enough for Essex U20 silver. Glen Paxman went one better by winning Essex Senior gold with a best jump of 5.86m. Meanwhile on track, the heats of the 200m were under way. Freddie Henderson did not progress from the heats but was delighted by a new PB, smashing his previous mark and dipping under twenty-five seconds for the very first time; his new mark is now 24.9 seconds. It was a similar story for Mia Rowan who achieved a new personal best but did not progress into the second round. 29.06 s was an excellent reward for her winter’s training. Marley Sarling did make it through the rounds to the final, which was a high quality affair featuring the fastest runner in the age group across Europe. Mario Dobrescu not unexpectedly won, but Sarling was not far behind in fourth. It was a very quick final and Sarling set a new PB of 23.35s, to catapult himself into the national top twenty five performers. The field action continued with triple jump with Leo Chashchin and Glen Paxman both back in action. Chaschchin managed 12.26m for fifth place in the Under 20 competition and Paxman rounded off a satisfying weekend by picking up senior silver with a jump of 11.48m. Teale Cunningham also took part but withdrew, with a best jump of 11.21m to take his place in the 400m final. Breaking up the 400m rounds and finals was the 800m. Harlow had only one competitor and that was Jamie Putt in the U20 event. Like others he had been hit hard by illness and had missed some training. Nevertheless, he managed fourth place overall and an excellent new PB of 2.00.88s. Just before the 400m finals got underway the pole vault came to its conclusion. Leo Chaschin was once again in action and won the Under 20 gold with a final vault of 3.70m. Harlow had two finalists, Teale Cunningham in the Under 20s and James Petty in the Under 17s. Cunningham was fifth in his final in a new PB time of 52.66s and Petty won bronze. His time of 53.35s was a new PB and will see him rise up the UK rankings a few places from his current thirtieth place.